you are not on the road to peace. The road to peace is peace." When I saw this quote, I was amazed. Such simplicity, yet so profound. It makes perfect sense and though I have felt that I know this and have known it, it still felt like a new bit of wisdom. Consider removing the word peace and making it a blank underline that we can write something else in. How about these? If you are losing well being in your quest for well being, you are not on the road to well being. The road to well being is well being. If you are losing patience in your quest for patience, you are not on the road to patience. The road to patience is patience. If you are losing love in your quest for love, you are not on the road to love. The road to love is love. If you are losing compassion in your quest for compassion, you are not on the road to compassion. The road to compassion is compassion. If you are losing _____________ in your quest for ______________, you are not on the road to ___________. The road to ____________ is ____________. Matching Our Attitude With Our Desires Is Worthy Of Awareness And Alignment. Spread Some Joy Today--The road to joy is JOY! is getting someone else to agree with their point of view. is developing a point of view in the first place." A brilliant quote from the marketing master, Seth Godin. Of course, getting others to buy in, believe in, or otherwise accept our point of view is a great goal. And the goal is only complete when they take some kind of action. These might actually be reversed in need, although are correct in the way we want things to happen. And, it is true that we often may want things to happen without much going on from us. Who wouldn't want that? I was talking with someone about commercial truck inventory today and how many keep ordering the same things over and over without any strategy whatsoever other than they stock x-number of units total. That would be like a grocery store only being concerned about the number of items and not having a strategy for the mix, quality, brands, selling habits, traditional sales patterns, and more. You know they do. I'm sure they have it down so that they don't miss things very often. 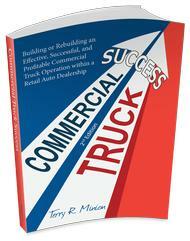 Yet commercial truck dealers haven't got a strategy very often. How could they? They don't keep track, so where would they get the information for an improved strategy? Of course, this applies to every kind of business or enterprise, for-profit and non-profit. Each needs to have a strategy in order to learn how to change, to grow, to improve. This will also require some kind of statistics. We need not drive ourselves crazy with them, but we should at least have some worthy information to help us make better and better decisions as we move forward. Otherwise, we just keep doing the same things and getting the same results. Spread Some Joy Today--by seeing how many things you can appreciate and enjoy today. There is so much going on and we just don't pay much attention a good part of the time. Pay attention today. While teaching philosophy and global objectives is worthy, it only affects a certain percentage of people the way it is intended. I attended a training session today for some "disadvantaged youth." I'm not sure I agree they are disadvantaged, but there were a number of professional people on the panel each giving a bit of history of their career lives and much more in hopes of widening their knowledge and encouraging the sharpening of their goals. All are in high school and about ready to move into the working world. There was a lot of philosophy from personal stories presented and it was enlightening to me to hear all of them and appreciate their positions and see a bit of their path to whom they have become today. It will be interesting to see if any of the young people were convinced of anything, yet it created in me an appreciation of what many others have gone through, where they started and how they have overcome the odds. Throughout my life, I encountered resistance, some from others, but much of it from myself. I used to call them problems. Sometimes it was called drama. As I grew, I began to call them challenges. And, now, I call it contrast. Still, the one thing that stands out is the fact that all of them were helpful though I may not have had eyes to see that immediately. The contrast has caused within me a desire for something else, something more, and I made new choices, or course corrections which has led me quite perfectly to where I am today. 1. Be willing to try and fail. Take chances. Change the word work to play. 2. Never fear losing your job. Have confidence in your ability and abilities. Change is a given. Be the best you can be. 3. Always be looking ahead, while enjoying the present fully. Discovery is meaningful and valuable. 4. Invest and reinvest in yourself throughout your life. Become more every day. 5. Be a life-long learner. Educate yourself. Leaders are readers! 6. Do what you love, and love what you do. Follow your heart and passion. Be your own counsel. 7. Develop and expand constantly an attitude of gratitude and appreciation. 8. Learn to express yourself and your value. You are worthy and important. 9. Give willingly and openly. Become a generous person. 10. Enjoy yourself. Seek joy. Decide on purpose every single day. Remember, the American Dream is not about money, things and position. It is, and always was, about freedom--freedom of choice, freedom to move, freedom of speech, freedom to grow. And, it has nothing to do with where you start because everyone starts somewhere. There is no way. There is your way, my way, and their way. Everyone has a way. You and you alone are in charge of your choices, decisions, and actions. You are worthy. You are loved, and you matter. Words Don't Teach, Yet We Often Hope They Will. Spread Some Joy Today--by appreciating whomever you are around today. Wallace D Wattles had some perfect advice when he said that, "you can advance only by more than filling your present place." I don't know if you have ever read his book written in 1911 titled, The Science of Getting Rich, or not, and if you have not, I highly recommend it because it is a wealth of excellent ideas. You can advance only by more than filling your present place is just one, yet it is such a powerful statement. If you're a person who is managing people, you must have seen the likes of the quote I began with about complacency. And, I'm sure it must also make sense how the rest of that quote speaks the truth. When you tie that together with the Wallace D Wattles quote about more than filling your place, it is easy to see how people get into positions and then settle into a routine, or a rut, depending on the point of view. As a manager, you can't really motivate anyone. They have to motivate themselves. But, a manager has a huge amount of influence when it comes to familiarity and boredom. And, a manager can inject enthusiasm into an organization, along with a new, or renewed sense of purpose. Of course, this would require that the manager motivate him or herself to their original task of more than filling their present place. It is often easier to think of replacing those complacent ones, especially if they are longer in the tooth. I recall the first auto dealer I worked for who was a wise man. He had this phrase, "the new broom sweeps the cleanest." He was Irish to the core, and it wasn't until over 35 years later that I found where that idea came from. It is an old Irish saying that says, "A new broom sweeps clean, but the old broom knows the corners." As people near or pass typical retirement age, as managers, we need to think about how the organization will continue into the future and continue to grow. It is probably good at this point to begin bringing in new people without necessarily replacing the old. It is true that if the older ones are complacent and nothing is done about it, they will negatively affect the newer ones. I've seen that happen. However, it need not be that way. If you consider the full Irish saying quote and have the brooms work together, that floor could be spotless. Today is Easter, and for Christians, it is the single largest church day and celebration of Jesus. He made a difference then and thousands of years later is still making a difference to millions. There is a very, very long list of celebrity--people who became well known, even if for only a short time, who made a difference, and books written by them or about them continue their legacy now and beyond. There are current celebrities as well doing the same. Then there's you and me and so many of our friends and acquaintances who are not famous or celebrities except to a very tight group. And yet, each and every one is worthy of similar celebration with the likes of Jesus, and the thousands of celebrities and famous people that have gone before and live now. Each and every one of us makes a difference. Just by being alive, we make a difference. The effect of that difference might be beneficial, or at least we hope this, but it can also be otherwise. Of course, we are the only ones who choose this as it is never forced upon us. Celebrate the difference you make in others lives today. If you're going to church, don't forget to lift yourself up as worthy too. Feel the love that you release from yourself to so many others in the workplace, or the family at home. Consider the ways in what you do helps others, whether it is in your chosen career, or as simple as a smile of interaction with anyone in your path. This is not an ego trip. It is not being selfish the way most would apply that term. It is acknowledging the love you give in so many ways though kindness, accomplishment, building things, growing things, fixing things, soothing things and people, and a thousand other ways we affect one another. Today, I celebrate you! You are worthy! You make a tremendous difference. Celebrate How Your Own Value To Improves The World. Spread Some Joy Today--Share your value. we must plant more roses." It would be a real challenge to say it any better than this. Roses, love, joy, compassion, or any of those other kinds of not so good feelings. Sowing and reaping. Great stuff. What Is On The Planting Schedule Today? Spread Some Joy Today--Plant some, reap some, spread it around. I had an interesting night tonight. I haven't been attending fundraisers, mixers, and the like for a long time, and tonight I broke out and went to one. I knew only a couple of people in the whole group, but I got to meet some of those I've never before had the pleasure of meeting. What was also interesting is reconnecting and expanding the connection with the two people I knew the most. With the man part of that duo, it was the first time I think we have really connected at all. Prior to this it seemed very superficial and I never really got to know much about him as a result. This time, we chatted it up and had some fun sharing things. We're both musicians, although, I've not played since 2006 and he plays all the time, yet we still had much to talk about and agree on. I recall another person whom I knew superficially, and we met at a yogurt shop of one of my clients and that has led to an ongoing deep friendship. One never knows for sure where the next really good friend will come from. Maybe it will be someone totally new, and maybe someone you knew of for years, but never really knew at all. Be Wide Open To The Possibilities! It Could Be A Life-Changer! Spread Some Joy Today--Send some joy. Over-tip. The brightness that you bring with a little extra money is incredible. Yesterday, I spoke about a client and friend who called me for advice. There were actually two distinct things that were important in this call, and yesterday I spoke of one of them. Today, I will speak of the other. He sent me a small project to do and when I found out it was outside my skill box, I said so, but I said that I would try to figure it out. The truth is that I didn't want to do it because I don't know how and it seemed like a learning curve I had no current desire to go through. I failed to say anything about that. Several weeks passed and on this phone call, he asked how I was doing on the project. I said that I didn't want to learn how to do it and I didn't know how and basically was trying to make excuses. I could hear the disappointment in his voice and I felt poorly for the delay and then my inept response. But, he said he understood, and that was that. On the drive home from where I was, I'm thinking that he called me on my stuff and I was definitely exposed. So, I felt a leak in my integrity. A major leak. So, I wanted to remedy that and as soon as I got back to my office, I began to learn how to do it. It's amazing when you decide you're going to do it even when you don't know how. What before seemed like a mountain, now seemed quite possible and in a short time, I figured it out, completed the project and notified my friend and client. Sometimes we all get a bit off our integrity walk probably. I know I did. But, I am also very grateful that he called me on it ever so politely. He could have said, "you told me you were going to do your best to figure it out, and is this all you've got?" He would have been right, of course, but fortunately, he has more tact. And, even though we may trip off the trail, we only have to get back on the trail and follow through. It's Amazing What We Can Do When The Priority Is Moved To The Top Of The List For Whatever Reason May Be The Motivation. Spread Some Joy Today--How's your generous spirit? Feeling generous? Share that joy! My partner told me a funny thing today that reminded me of how many times we just respond to things without even giving the response any thought at all. He was talking with a guy and was suggesting some things to do to help him with his business, and the guy said, "Yeah, that sounds good. We should do that. Give me a call and we'll set an appointment." So, my partner is thinking to himself, "maybe I should hang up and call him right back? I'm on the phone with him now, what kind of response is this?" So, tactfully, he made an appointment. People often ask you how you're doing and so often we might say, "Oh, fine." As a salesman I used to have fun asking a stupid question (stupid for any salesperson to ask, that is) such as, "Can I help you?" Of course, the common answer is, "no thanks, just looking." The best strategy is to avoid questions where you know people typically will answer thoughtlessly. Or not. Sometimes it's fun to ask stupid questions. Or, If You're On The Receiving End, Throw A Change-up! You Might Even Wake Them Up! Spread Some Joy Today--Have some fun today. Silliness is underrated. or take them with gratitude." I am taking a pause today to thank all the people who read these Daily Inspirations whether by subscription, the blogs, social media or referred or forwarded by a friend. I appreciate your reading and the comments I receive from time to time. I find myself amazed that this has gone on as long as it has (over 1,646 posts) and amazed further that I still have the passion and purpose to continue to do this every single day since mid-2009. I also have to admit to selfish motives to become a better writer, and to teach things that I most want to know for myself, while hoping to uplift anyone who might enjoy that feeling or might be attracting these messages. Thank you for taking the time out of your day to look at these efforts. I love you all, whomever you are. I Am Blessed And Grateful. Thank You. Spread Some Joy Today--Pay it forward.